Sheraton Montazah Hotel’s 289 comfortable guest rooms and suites offer the space you need to relax or get some work done. Find an additional level of comfort in Sheraton Montazah Hotel Club rooms. Located on preferred floors, Sheraton Club guest rooms offer upgraded amenities, free bottled water, and complimentary fitness center access. Club guests also have special access to the Club Lounge. A relaxing, upscale space, the Club Lounge offers complimentary breakfast, afternoon hors d’oeuvres and a variety of beverage options. Take advantage of the private Club Lounge where you can connect with friends, meet with your team, or simply relax by catching your favorite TV show. Need to get some work done? A copier/fax/printer and complimentary office supplies are ready to go. Coquillage Café is an all-day dining restaurant with a wide choice of continental meals. Experience authentic Italian dishes at La Mama Restaurant. Let the fun linger into the evening at Aquarius Discotheque with entertaining parties and dance competitions. Whether you are planning an important business meeting or a grand social event, Sheraton Montazah Hotel has a great setting, which can be tailored to meet your individual needs. Friendly, professional service and the latest equipment will ensure the success of your event. 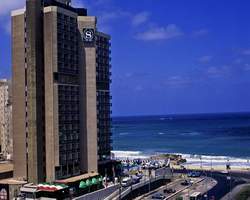 Sheraton Montazah Hotel will take care of you and anticipate all your needs. Our courteous staff provides 24-hour guest service for your convenience. A fully equipped business center caters to all of your business needs. Be sure to enjoy a reenergizing workout in our fitness center. Pets are not allowed. Only seeing eye dogs are allowed. No other pets are permitted.